Is Cold Brew Coffee Craze a Summer Consumption Game Changer? For U.S. coffee shops, business usually cools down as the weather heats up. But as the latest craze, cold brew coffee, moves from a hipster infatuation to mainstream staple, that traditional seasonal pattern is unraveling. Since cold brew often uses more beans than traditional iced coffee, it could boost overall U.S. demand for coffee beans, partially offsetting the effect of the more efficient single-serve pods popularized by Keurig Green Mountain. Peet’s Coffee & Tea, one of the nation’s biggest coffee chains with about 400 stores, replaced traditional iced coffee with cold brew in June, and has seen cold brew sales exceed last year’s iced coffee sales by as much as 70 percent. For Peet’s, which reported total revenue last year of $540 million, focusing on cold brew was part of an effort to slow the seasonal decline in coffee sales, which several roasters estimated at between 15 and 20 percent. Others have jumped on board, including the nation’s largest coffee chain, Starbucks, which launched cold brew at 2,800 stores this summer. Hector Mai, manager of a Guy & Gallard cafeteria in midtown Manhattan, began serving cold brew this summer and has already noticed iced tea sales declining. 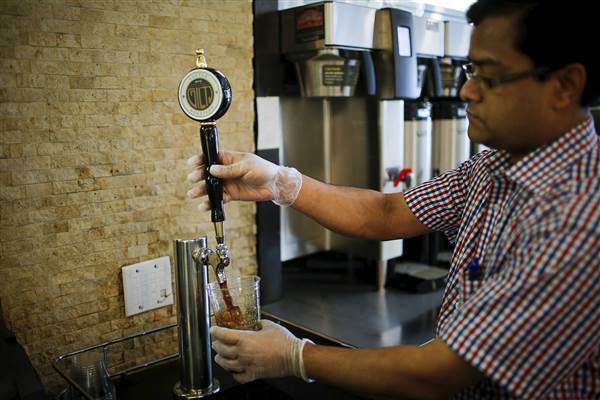 “One day, there will be no regular iced coffee,” Mai said, while pouring a nitrogen-infused cold brew made by Brooklyn-based Gillies Coffee from a tap, just like beer. Cold brew is made by steeping fresh ground coffee in cold water for between 12 and 24 hours, while traditional iced coffee is made by cooling hot-brewed coffee and serving it over ice. The cool temperature and lack of movement, however, mean not as much flavor and strength is extracted from each bean compared to hot or traditional iced coffee, prompting roasters such as Peet’s, Gillies and Brooklyn Roasting Co. to use a larger dose of ground coffee in cold brew blends. Michael Pollack, managing partner of Brooklyn Roasting, uses a double dose of coffee in his cold brew, and says he goes through beans twice as fast during the summer as other seasons. Peet’s makes up for higher raw material costs by charging $2.45 for a small cold brew, compared with the $2 it used to charge for a small iced coffee. Starbucks charges customers $3.25 for a grande cold brew, 60 cents more than a grande iced coffee. Gillies, which has been roasting coffee in Brooklyn for 175 years, has gotten in on the trend, launching cold brew on tap to supply local coffee shops and restaurants like Guy & Gallard in April. It now ships about 65 kegs a week to about 50 customers, Gillies President Donald Schoenholt said from the company’s roasting plant near Brooklyn’s waterfront. That’s only about 3 percent of the 1 million pound-a-year roaster’s business, but Schoenholt said entering the space was crucial for capturing summertime coffee drinkers. “We think two, three, four, five years from now, we’re going to see a significant bump” in summer coffee sales, Schoenholt said while pouring a cold brew from a tap this week. To be sure, not all cold brewers use a higher dose, and some specialty roasters argue it fails to extract quality beans’ full flavor potential. Still, Americans’ thirst for cold coffee has been rising for years. Last year, they consumed 90 million gallons of ready-to-drink coffee beverages, ranging from bottled Starbucks Frappuchinos to cartons of Stumptown cold brew, up 52 percent from 2009, data from Beverage Marketing Corp. show. By contrast, sales of carbonated soft drinks, which still swamps the coffee market, dropped for five straight years to 12.8 billion gallons last year. That was down 9 percent from 2009. In addition, the percentage of coffee shops and restaurants serving iced coffee rose from 19 percent in 2009 to 24 percent in 2013, data from market research firm Mintel show. Cold brew was popularized when Portland-based, private equity-backed Stumptown Coffee Roasters started selling ready-to-drink coffee in a “stubby” bottle in 2011. Now with Starbucks’ entrance, cold brew has hit the mainstream. “Having Starbucks come into it is the 5,000-pound gorilla in every conversation about coffee,” Pollack of Brooklyn Roasting said. The popularity growth of this stronger brewing method may support overall U.S. coffee demand, providing a counter-weight to the growth of single-serve coffee pods, which are widely seen as limiting demand by reducing coffee waste. U.S. coffee consumption will fall next year for the first time in six years, according to a U.S. Department of Agriculture forecast. “If we can make cold a more compelling thing, that will take out a little bit of the sting,” said Brett Struwe of Caribou Coffee. Schoenholt recalled entering a Brooklyn convenience store this summer and noting the large quantities of ready-to-drink cold coffee drinks for sale on shelf space once dominated by more traditional American summertime favorites.